From the team that brought you Superbad, Pineapple Express, This is the End & Neighbors comes the highest grossing R-rated animated film of all-time, Sausage Party, debuting on digital November 1 and Blu-ray, DVD and next-generation 4K Ultra HD November 8 from Sony Pictures Home Entertainment. Co-produced by Annapurna Pictures, the “wildly innovative” (Anna Klassen, BUSTLE) film follows Frank, a hot dog who leads a group of supermarket products on an existential journey to discover the truth about their own existence and what happens when they become “chosen” to leave the grocery store. The voice talent features a who’s who of today’s comedy stars, including Seth Rogen (This is the End), Kristen Wiig (Ghostbusters), Jonah Hill (Superbad), Bill Hader (Trainwreck), Michael Cera (Superbad), James Franco (Pineapple Express), Danny McBride (“Vice Principals”), Craig Robinson (This is the End), Paul Rudd (Ant-Man), Nick Kroll (Date Night), David Krumholtz (I Saw the Light), Edward Norton (Moonrise Kingdom) and Salma Hayek (Here Comes the Boom). The Blu-ray, DVD, digital and 4K Ultra HD releases come loaded with bonus material, including behind-the-scenes featurettes. Fans step into the recording booth with Seth Rogen, Kristen Wiig, Michael Cera, Nick Kroll, Edward Norton, Jonah Hill, Salma Hayek, Paul Rudd, Bill Hader and more to see how these comedy superstars brought their characters to life in “The Booth.” In “The Great Beyond” viewers can hear how the team persuaded famed composer Alan Menken to craft a musical number unlike anything he’s done before. In “Animation Imaginatorium,” Seth Rogen channels another famous king of animation. And in “The Pitch,” fans can watch a vintage interview where Seth Rogen and Evan Goldberg discuss their pitching process and hint at the beginning idea for Sausage Party. Features exclusive to the Blu-ray include: “Good Food Gag Reel,” a hilarious series of outtakes; “Line-O-Rama,” a series of side-splitting alternative takes and off-the-cuff improvs and; “Shock and Awe: How Did This Get Made?,” where fans learn how Seth Rogen and his team finally convinced someone to make a “hard R” rated animated movie. 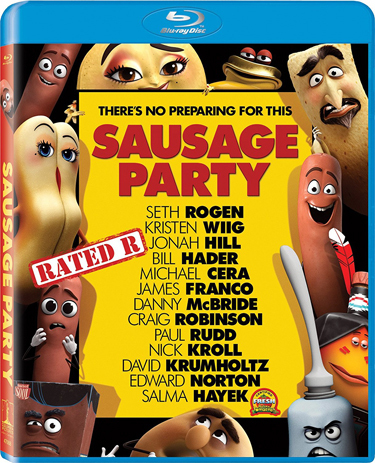 In addition, exclusive to the digital release is an Alternate Ending where our edible friends cross over to the real world and catch Seth Rogen, Michael Cera and Edward Norton enjoying a horrifying meal; “Alt Ending: The Real World Live Action,” which takes viewers behind-the-scenes of the alternate ending; “Animated Improv” where the all-star cast of comic geniuses come up with funny one-liners while recording their voice parts and; “Concept Art to Screen” where fans can go behind the scenes of the character development process and see how the filthy-mouthed food items were drawn to perfection. 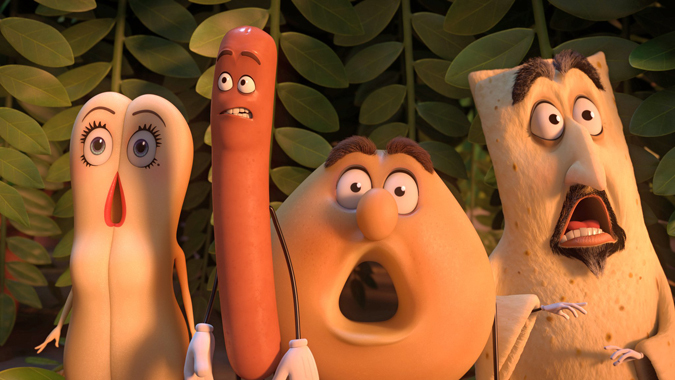 Directed by Conrad Vernon & Greg Tiernan, SAUSAGE PARTY is based on a story by Seth Rogen, Evan Goldberg and Jonah Hill and a screenplay by Kyle Hunter, Ariel Shaffir, Seth Rogen and Even Goldberg. The film is produced by Megan Ellison, Seth Rogen, Evan Goldberg and Conrad Vernon and executive produced by Jonah Hill, Kyle Hunter and David Distenfeld.